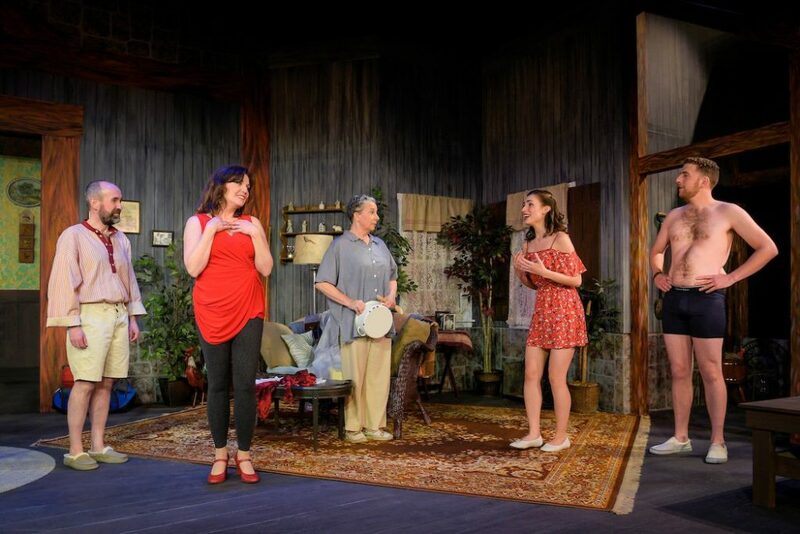 Chekhov’s early 20th century Russia finds a new home in 21st Century Bucks County, Pennsylvania, one of the swankiest suburbs in the U.S. Well, a funny version of Bucks County, as envisioned by Christopher Durang–which won him the Tony Award for Best Play of 2013. Paul Araquistain, Donna Jean Turner, Laurie Strawn, Vessy Ivanova, Lucas Brandt. 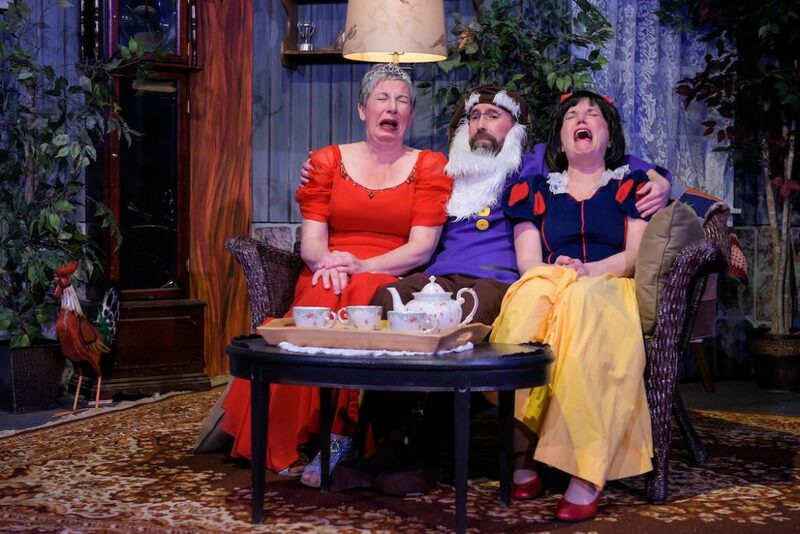 Durang’s absurd characters are forced to negotiate emotional minefields. Ultimately, they confront a world that’s changing too fast. In his stupendous Act Two monologue, Vanya (Paul Araquistain) laments, “There are 785 television channels. You can watch the news report that already agrees with what you think.” Vanya’s 2013 complaint resonates with events today, suggesting Durang’s prophetic genius. Durang is practicing remarkable clairvoyance. His larger than life character Cassandra (sparkling Elizabeth Jones) is truly psychic. Cassandra dances around the stage and dire delivers prophesies about the future. She serves as our moral compass, pushing the protagonists and us toward moral clarity. “Vanya” poses timely questions about mental health and the vices of social media. These questions, inconceivable in Chekhov’s lifetime, provoke us to reflect and re-think. The story revolves around the relationship of three adult siblings, Vanya, Sonia (Laurie Strawn) and Masha (Donna Jean Turner) Early on, melancholy Sonia announces, “If everyone took anti-depressants, Chekhov would have had nothing to write about” to her brother Vanya. Sonia and Vanya, along with their younger sister Masha, struggle to accept their aging state. Their choices evoke stark moments of dark, poignant humor. Sonia is bored with life, but afraid to leave the house. Vanya is insecure and dreams of writing plays. Masha has escaped the burbs to become a successful movie star. She lives a bittersweet, vain life, instead of facing up to her fading youth. Masha has returned home with a new boyfriend, the young, frat-bro, Spike (talented Lucas Brandt), an actor without much talent. Spike’s claim to fame is making the final auditions for HBO’s “Entourage 2.” Brandt’s Spike steals the scene that wins the most laughs, when he treats us to a performance of his audition monologue. When Spike meets the aspiring, young actress “Nina” (lovely Vessy Ivanova), trouble and jealousy erupt. Everyone navigates awkwardly toward love, ambition, and self-confidence–all hilarious to behold. 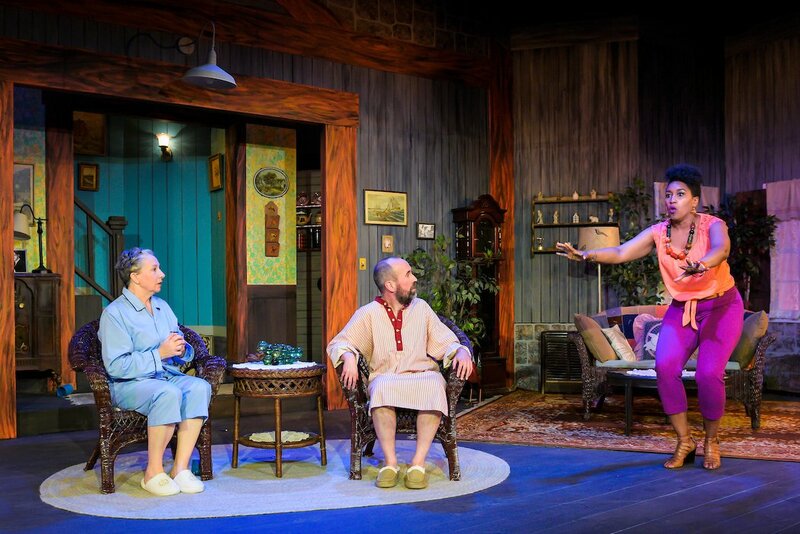 CCCT’s quaint country-home set and vibrant costuming accentuate Durang’s comedy. Designer Gillian Eichenberger has dressed Sonia to the nines as the Wicked Queen from Snow White, in a red gown and crystal tiara that inspire a round of applause. She looks like Maggie Smith on her way to the Oscars, another wild Durang mix of real life with wild fantasy. 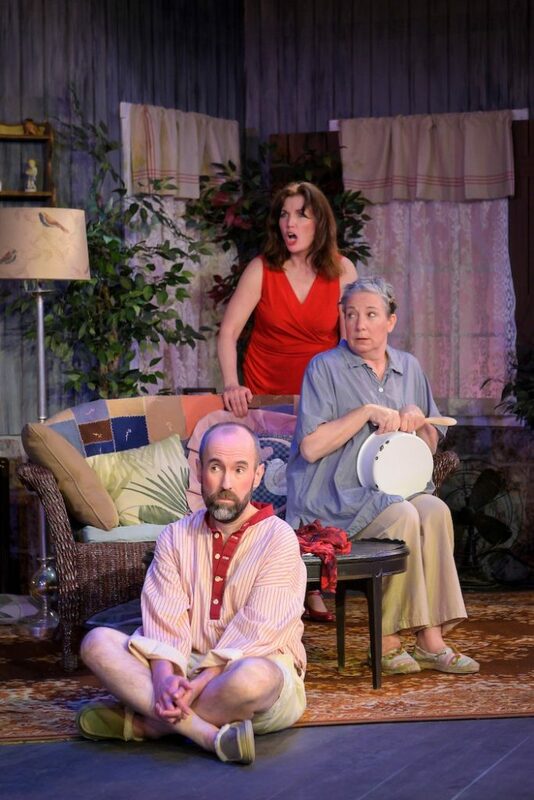 Durang’s absurd comedy is a joy to behold. Cast: Paul Araquistain, Laurie Strawn, Donna Jean Turner, Lucas Brandt, Vessy Ivanova, and Elizabeth Jones. 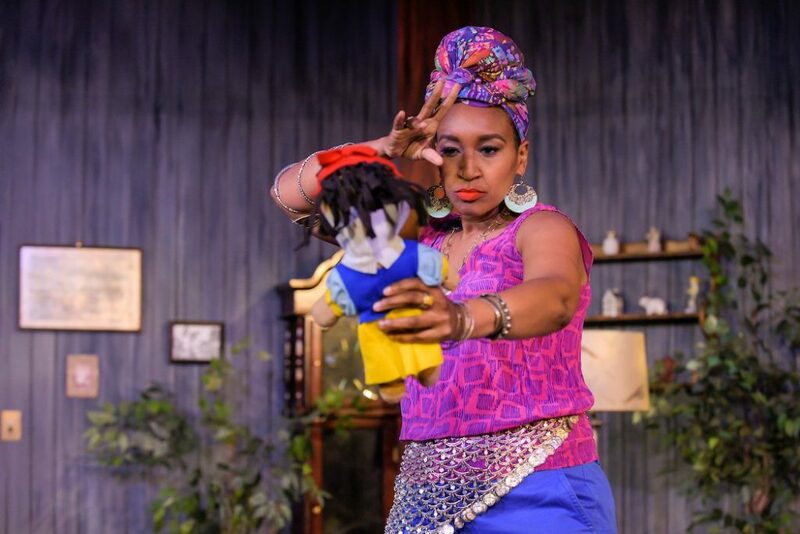 “Daughter of a Garbageman” Garnishes Oppression with Humor, at The Marsh, S.F.